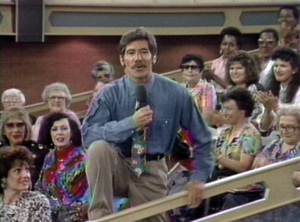 Geraldo’s television producers called Joey Skaggs and invited him to appear on their show. Skaggs asked what the show was about and who else would be featured. Told it was about scam artists, con artists, and rip off artists–people who exploit other people for money–Skaggs declined, explaining that this was not what he did. He does not take money, and his purpose is completely different. The show went on without him but they used numerous video clips of his hoaxes and discussed his work anyway. A short time later, the producers called again, this time asking Skaggs to do a hoax specifically for them. Geraldo wanted to follow him around with cameras, and then reveal the hoax exclusively on his show. Skaggs again declined, believing this was just self-aggrandizement for Geraldo. The third time the producers called, they said they would like Skaggs to speak as a media critic. Skaggs didn’t believe them, knowing the nature of these types of shows, but agreed to go on the show anyway. He had decided to hoax them. His opportunity came when they asked him to provide a journalist who had been the victim of one of his hoaxes and who would be willing to go on national television to talk about it. Skaggs wondered what journalist would be willing to go on national television to be derided. Furthermore, would they have anything constructive to say about his work? Instead, he made up a story about New York’s’ hip hidden real estate market: Artists were living illegally in converted water towers on the tops of buildings, with great commanding views and cheap rent. He and writer friend Nancy Weber, who had performed with Skaggs previously, composed an article which he then mocked up to look like an Associated Press article in the New York Post Real Estate Section. Weber agreed to play the part of the duped AP journalist who’d written the story. When called to the studio for the pre-interview, Skaggs, who had inserted the fake story into his press packet, conned the producers into focusing on this hoax and inviting Weber, the fallen journalist, to appear on the show. 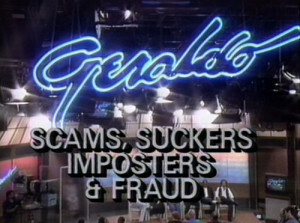 After the show aired, Skaggs told the show producers and the media that Geraldo had been hoaxed. The producers promised to tape a retraction but they never did. Television reporter Steve Powers exposed the hoax on Fox TV. Powers had earlier covered Fish Condos, so he was familiar with Skaggs’ work (a fact that did him no good the next year when he interviewed a priest pedaling a portable confessional booth to the Democratic National convention).